Not to be confused with Liquefied natural gas. Two 45 kg (99 lb) LPG cylinders in New Zealand used for domestic supply. 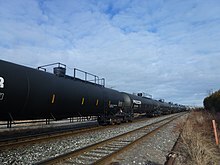 Tank cars in a Canadian train for carrying liquefied petroleum gas by rail. 10), and, most commonly, mixes including both propane and butane. In the northern hemisphere winter, the mixes contain more propane, while in summer, they contain more butane. In the United States, mainly two grades of LPG are sold: commercial propane and HD-5. These specifications are published by the Gas Processors Association (GPA) and the American Society of Testing and Materials (ASTM). Propane/butane blends are also listed in these specifications. LPG has a very wide variety of uses, mainly used for cylinders across many different markets as an efficient fuel container in the agricultural, recreation, hospitality, industrial, construction, sailing and fishing sectors. It can serve as fuel for cooking, central heating and to water heating and is a particularly cost-effective and efficient way to heat off-grid homes. LPG is used for cooking in many countries for economic reasons, for convenience or because it is the preferred fuel source. 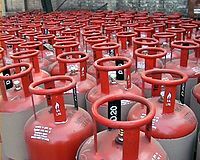 In India, nearly 8.9 million tons of LPG was consumed in the six months between April and September 2016 in the domestic sector, mainly for cooking. The number of domestic connections are 215 million (i.e., one connection for every six people) with a circulation of more than 350 million LPG cylinders. Most of the LPG requirement is imported. Piped city gas supply in India is not yet developed on major scale. LPG is subsidised by the Indian government for domestic users. Increase in LPG prices has been a politically sensitive matter in India as it potentially affects the middle class voting pattern. LPG was once a standard cooking fuel in Hong Kong; however, the continued expansion of town gas to newer buildings has reduced LPG usage to less than 24% of residential units. However, other than electric, induction, or infrared stoves, LPG-fueled stoves are the only type available in most suburban villages and many public housing estates. LPG is the most common cooking fuel in Brazilian urban areas, being used in virtually all households, with the exception of the cities of Rio de Janeiro and São Paulo, which have a natural gas pipeline infrastructure. Since 2001, poor families receive a government grant ("Vale Gás") used exclusively for the acquisition of LPG. Since 2003, this grant is part of the government main social welfare program ("Bolsa Família"). Also, since 2005 the national oil company Petrobras differentiates between LPG destined for cooking and LPG destined for other uses, practicing a lower price for the former. This is a result of a directive from Brazilian federal government, but its demise is currently being debated. LPG is commonly used in North America for domestic cooking and outdoor grilling. Predominantly in Europe and rural parts of many countries, LPG can provide an alternative to electric heating, heating oil, or kerosene. LPG is most often used in areas that do not have direct access to piped natural gas. LPG can be used as a power source for combined heat and power technologies (CHP). CHP is the process of generating both electrical power and useful heat from a single fuel source. This technology has allowed LPG to be used not just as fuel for heating and cooking, but also for decentralized generation of electricity. LPG can be stored in a variety of manners. LPG, as with other fossil fuels, can be combined with renewable power sources to provide greater reliability while still achieving some reduction in CO2 emissions. However, as opposed to wind and solar renewable energy sources, LPG can be used as a standalone energy source without the prohibitive expense of electrical energy storage. In many climates renewable sources such as solar and wind power would still require the construction, installation and maintenance of reliable baseload power sources such as LPG fueled generation to provide electrical power during the entire year. 100% wind/solar is possible, the caveat being that even in 2018 the expense of the additional generation capacity necessary to charge batteries, plus the cost of battery electrical storage, still makes this option economically feasible in only a minority of situations. When LPG is used to fuel internal combustion engines, it is often referred to as autogas or auto propane. In some countries, it has been used since the 1940s as a petrol alternative for spark ignition engines. In some countries, there are additives in the liquid that extend engine life and the ratio of butane to propane is kept quite precise in fuel LPG. Two recent studies have examined LPG-fuel-oil fuel mixes and found that smoke emissions and fuel consumption are reduced but hydrocarbon emissions are increased. The studies were split on CO emissions, with one finding significant increases, and the other finding slight increases at low engine load but a considerable decrease at high engine load. Its advantage is that it is non-toxic, non-corrosive and free of tetraethyllead or any additives, and has a high octane rating (102–108 RON depending on local specifications). It burns more cleanly than petrol or fuel-oil and is especially free of the particulates present in the latter. 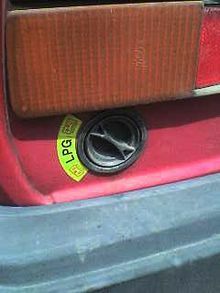 LPG has a lower energy density per liter than either petrol or fuel-oil, so the equivalent fuel consumption is higher. Many governments impose less tax on LPG than on petrol or fuel-oil, which helps offset the greater consumption of LPG than of petrol or fuel-oil. However, in many European countries this tax break is often compensated by a much higher annual tax on cars using LPG than on cars using petrol or fuel-oil. Propane is the third most widely used motor fuel in the world. 2013 estimates are that over 24.9 million vehicles are fueled by propane gas worldwide. Over 25 million tonnes (over 9 billion US gallons) are used annually as a vehicle fuel. Not all automobile engines are suitable for use with LPG as a fuel. LPG provides less upper cylinder lubrication than petrol or diesel, so LPG-fueled engines are more prone to valve wear if they are not suitably modified. Many modern common rail diesel engines respond well to LPG use as a supplementary fuel. This is where LPG is used as fuel as well as diesel. Systems are now available that integrate with OEM engine management systems. LPG can be converted into alkylate which is a premium gasoline blending stock because it has exceptional anti-knock properties and gives clean burning. LPG is instrumental in providing off-the-grid refrigeration, usually by means of a gas absorption refrigerator. Blended of pure, dry propane (refrigerant designator R-290) and isobutane (R-600a) the blend "R-290a" has negligible ozone depletion potential and very low global warming potential and can serve as a functional replacement for R-12, R-22, R-134a and other chlorofluorocarbon or hydrofluorocarbon refrigerants in conventional stationary refrigeration and air conditioning systems. Such substitution is widely prohibited or discouraged in motor vehicle air conditioning systems, on the grounds that using flammable hydrocarbons in systems originally designed to carry non-flammable refrigerant presents a significant risk of fire or explosion. Vendors and advocates of hydrocarbon refrigerants argue against such bans on the grounds that there have been very few such incidents relative to the number of vehicle air conditioning systems filled with hydrocarbons. One particular test, conducted by a professor at the University of New South Wales, unintentionally tested the worst-case scenario of a sudden and complete refrigerant expulsion into the passenger compartment followed by subsequent ignition. He and several others in the car sustained minor burns to their face, ears, and hands, and several observers received lacerations from the burst glass of the front passenger window. No one was seriously injured. Global LPG production reached over 292 million metric tons/yr in 2015, while global LPG consumption to over 284 mn t/yr. 62% of LPG is extracted from natural gas while the rest is produced by the petrochemical refineries from crude oil. 44% of global consumption is in the domestic sector. The USA is the leading producer and exporter of LPG. According to 2010–12 estimates, proven world reserves of natural gas, from which most LPG is derived, stand at 300 trillion cubic meters (10,600 trillion cubic feet). Added to the LPG derived from cracking crude oil, this amounts to a major energy source that is virtually untapped and has massive potential. Production continues to grow at an average annual rate of 2.2%, virtually assuring that there is no risk of demand outstripping supply in the foreseeable future. LPG is composed mainly of propane and butane, while natural gas is composed of the lighter methane and ethane. LPG, vaporised and at atmospheric pressure, has a higher calorific value (46 MJ/m3 equivalent to 12.8 kWh/m3) than natural gas (methane) (38 MJ/m3 equivalent to 10.6 kWh/m3), which means that LPG cannot simply be substituted for natural gas. In order to allow the use of the same burner controls and to provide for similar combustion characteristics, LPG can be mixed with air to produce a synthetic natural gas (SNG) that can be easily substituted. LPG/air mixing ratios average 60/40, though this is widely variable based on the gases making up the LPG. The method for determining the mixing ratios is by calculating the Wobbe index of the mix. Gases having the same Wobbe index are held to be interchangeable. LPG-based SNG is used in emergency backup systems for many public, industrial and military installations, and many utilities use LPG peak shaving plants in times of high demand to make up shortages in natural gas supplied to their distributions systems. LPG-SNG installations are also used during initial gas system introductions, when the distribution infrastructure is in place before gas supplies can be connected. Developing markets in India and China (among others) use LPG-SNG systems to build up customer bases prior to expanding existing natural gas systems. LPG-based SNG or natural gas with localized storage and piping distribution network to the house holds for catering to each cluster of 5000 domestic consumers can be planned under initial phase of city gas network system. This would eliminate the last mile LPG cylinders road transport which is a cause of traffic and safety hurdles in Indian cities. These localized natural gas networks are successfully operating in Japan with feasibility to get connected to wider networks in both villages and cities. 2 per kWh produced by oil, 70% of that of coal, and less than 50% of that emitted by coal-generated electricity distributed via the grid. Being a mix of propane and butane, LPG emits less carbon per joule than butane but more carbon per joule than propane. LPG burns more cleanly than higher molecular weight hydrocarbons because it releases fewer particulates. In a refinery or gas plant, LPG must be stored in pressure vessels. These containers are either cylindrical and horizontal or spherical. Typically, these vessels are designed and manufactured according to some code. In the United States, this code is governed by the American Society of Mechanical Engineers (ASME). LPG containers have pressure relief valves, such that when subjected to exterior heating sources, they will vent LPGs to the atmosphere or a flare stack. If a tank is subjected to a fire of sufficient duration and intensity, it can undergo a boiling liquid expanding vapor explosion (BLEVE). This is typically a concern for large refineries and petrochemical plants that maintain very large containers. In general, tanks are designed so that the product will vent faster than pressure can build to dangerous levels. One remedy that is utilized in industrial settings is to equip such containers with a measure to provide a fire-resistance rating. 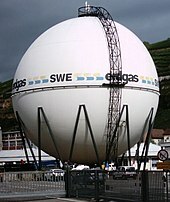 Large, spherical LPG containers may have up to a 15 cm steel wall thickness. They are equipped with an approved pressure relief valve. A large fire in the vicinity of the vessel will increase its temperature and pressure. The relief valve on the top is designed to vent off excess pressure in order to prevent the rupture of the container itself. Given a fire of sufficient duration and intensity, the pressure being generated by the boiling and expanding gas can exceed the ability of the valve to vent the excess. If that occurs, an overexposed container may rupture violently, launching pieces at high velocity, while the released products can ignite as well, potentially causing catastrophic damage to anything nearby, including other containers. People can be exposed to LPG in the workplace by breathing it in, skin contact, and eye contact. The Occupational Safety and Health Administration (OSHA) has set the legal limit (Permissible exposure limit) for LPG exposure in the workplace as 1000 ppm (1800 mg/m3) over an 8-hour workday. The National Institute for Occupational Safety and Health (NIOSH) has set a recommended exposure limit (REL) of 1000 ppm (1800 mg/m3) over an 8-hour workday. At levels of 2000 ppm, 10% of the lower explosive limit, LPG is considered immediately dangerous to life and health (due solely to safety considerations pertaining to risk of explosion). ^ Alvi, Moin ud-Din. "Aerosol Propellant | Aerosol Propellant Gas | Aerosol Supplies Dubai – Brothers Gas". www.brothersgas.com. Archived from the original on 30 December 2016. Retrieved 14 June 2016. ^ "Performance and Safety of LPG Refrigerants" (PDF). Archived from the original (PDF) on 10 March 2015. ^ Unipetrol. "Analysis of seasonal mixtures - Propane-butane Fuel Mixture (Summer, Winter)". Archived from the original on 9 August 2010. Retrieved 29 April 2013. ^ "Liquefied Petroleum Gas Specifications and Test Methods". Gas Processors Association. Archived from the original on 21 June 2013. Retrieved 18 May 2012. ^ "ASTM D1835 - 11 Standard Specification for Liquefied Petroleum (LP) Gases". American Society for Testing & Materials. Archived from the original on 22 May 2012. ^ Horst Bauer, ed. (1996). Automotive Handbook (4th ed.). Stuttgart: Robert Bosch GmbH. pp. 238–239. ISBN 0-8376-0333-1. ^ "LPG Profile" (PDF). Archived (PDF) from the original on 8 April 2017. Retrieved 30 March 2017. ^ "ANP quer fim de diferença entre preços do gás de botijão - 17/08/2017 - Mercado". Folha de S.Paulo. Retrieved 25 January 2019. ^ a b Zhang, Chunhua; Bian, Yaozhang; Si, Lizeng; Liao, Junzhi; Odbileg, N (2005). "A study on an electronically controlled liquefied petroleum gas-diesel dual-fuel automobile". Proceedings of the Institution of Mechanical Engineers, Part D: Journal of Automobile Engineering. 219 (2): 207. doi:10.1243/095440705X6470. ^ a b Qi, D; Bian, Y; Ma, Z; Zhang, C; Liu, S (2007). "Combustion and exhaust emission characteristics of a compression ignition engine using liquefied petroleum gas–fuel-oil blended fuel". Energy Conversion and Management. 48 (2): 500. doi:10.1016/j.enconman.2006.06.013. ^ "European Commission on retrofit refrigerants for stationary applications" (PDF). Archived from the original (PDF) on 5 August 2009. Retrieved 30 July 2009. ^ "U.S. EPA hydrocarbon-refrigerants FAQ". United States Environmental Protection Agency. Archived from the original on 7 August 2009. Retrieved 30 July 2009. ^ "Society of Automotive Engineers hydrocarbon refrigerant bulletin". Sae.org. 27 April 2005. Archived from the original on 5 May 2005. Retrieved 30 July 2009. ^ "New South Wales (Australia) Parliamentary record, 16 October 1997". Parliament.nsw.gov.au. 16 October 1997. Archived from the original on 1 July 2009. Retrieved 30 July 2009. ^ "New South Wales (Australia) Parliamentary record, 29 June 2000". Parliament.nsw.gov.au. Archived from the original on 22 May 2005. Retrieved 30 July 2009. ^ "Statistical Review of Global LPG 2016" (PDF). Archived (PDF) from the original on 10 April 2017. Retrieved 13 January 2017. ^ "WLPGA Annual Report 2015" (PDF). Archived (PDF) from the original on 10 April 2017. Retrieved 13 January 2017. ^ "BPN Butane - Propane news". Archived from the original on 30 December 2017. Retrieved 10 April 2017. ^ Green Finance and Investment Promoting Clean Urban Public Transportation and Green Investment in Kazakhstan. OECD Publishing. 2017. p. 124. ISBN 9264279644. ^ Shah, Yatish T. (16 March 2017). Chemical Energy from Natural and Synthetic Gas. CRC Press. ISBN 9781315302348. ^ "CDC - NIOSH Pocket Guide to Chemical Hazards - L.P.G." www.cdc.gov. Archived from the original on 8 December 2015. Retrieved 28 November 2015.